The amazingly narrow Aareschlucht in the Haslital of the Berner Oberland is an easy walk for visitors of all ages mostly on wooden boards and solid paving. Switzerland’s longest river, the Aare, flows from the Alps via lakes Brienz, Thun, and Biel as well as through Bern and Solothurn on its way to the Rhine. Just south of Meiringen in the Haslital, the Aare carved its way through the mountains in a gorge that is at times a mere meter wide. Tunnels and wooden walkways allow visitors to experience this natural wonder with little real effort. Most of the gorge is even accessible to wheelchair users. Switzerland is a country of astonishing natural beauty but rarely is natural phenomena as easily accessible as the Aareschlucht (Aare Gorge) between Meiringen and Innertkirchen in the Haslital of the Berner Oberland region. Here, the Aare River has carved a 1,400 m gorge through limestone. The Aare Gorge is at its narrowest at Kleinen Enge where it is a mere meter wide. Here the water is around 3 m deep while the limestone rock walls reach nearly 200 m high. The speed of the water flow ranges from 4 to 13 km/h, allowing water to pass through the 1,400-m long gorge in around 12 minutes. 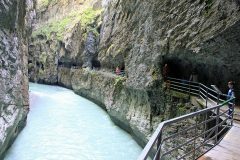 The first walkways in the Aare Gorge were already erected in 1888. Currently, a series of tunnels and walkways with safety railings allow visitors to easily walk the full length of the gorge in around 45 minutes. Two-thirds of the gorge is even accessible to wheelchair users while the rest is with some stairs but no significant inclines. Access to the gorge is possible from either end. En route visitors can touch both sides of the gorge walls at the Kleinen Enge, see a waterfall, caves used during the Second World War, the end of a dried out glacial river, and glacier mills. A rope suspension bridge at the eastern end allows hikers to cross the river. 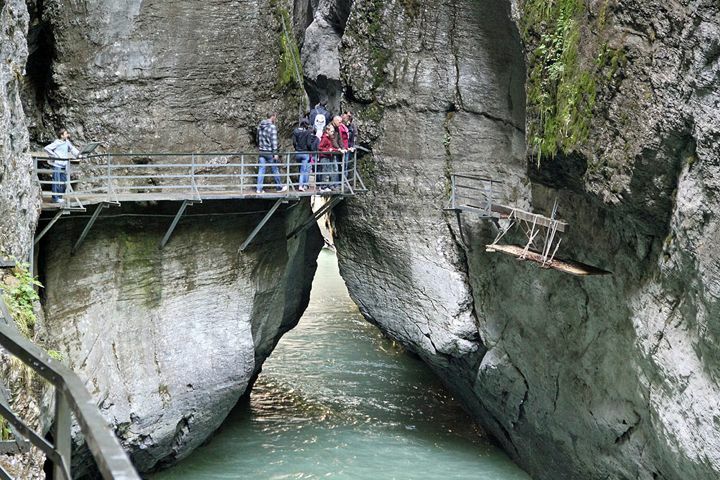 The western entrance to the Aare Gorge (Meiringen side) is open daily from early April to November 1, while the eastern entrance (Innertkirchen side) is open from mid-May to mid-October. Opening hours are from 8:30 am to at least 5:30 pm. From mid-June to mid-October the gorge is open until 10 pm from Wednesday to Sunday and lit when necessary. The western entrance has the more extensive facilities and should also be used by wheelchair users. Admission is CHF7.50 for adults and CHF4 for children 7 to 16. Combination tickets with other sights such as the Reichenbach Falls are available. Alternatively, visitors can hike back to the original entrance through the gorge or via a longer hiking trail through the forest. Other popular sights in the region include the Sherlock Holmes Museum in Meiringen, the Reichenbachfall waterfalls where the fictitious detective vanquished Prof Moriarty, the Ballenberg Open-Air Museum of Rural Swiss Architecture, and pleasure boat cruises on Lake Brienz.